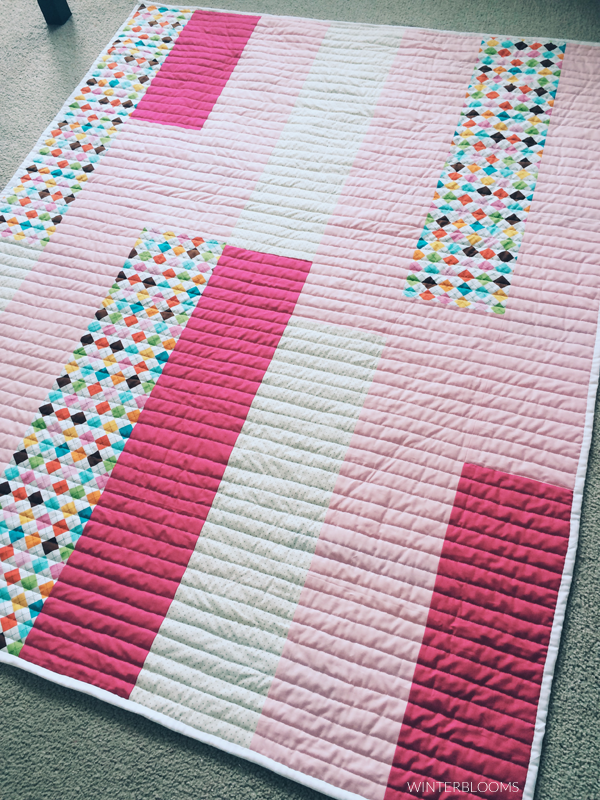 This spring's project was an attempt at another quilt. While the first one turned out pretty good for a first-timer, there were a few things that I really wanted to practice. For example, I wanted to work on the process of guiding the whole quilt through the machine when the actual quilting takes place. 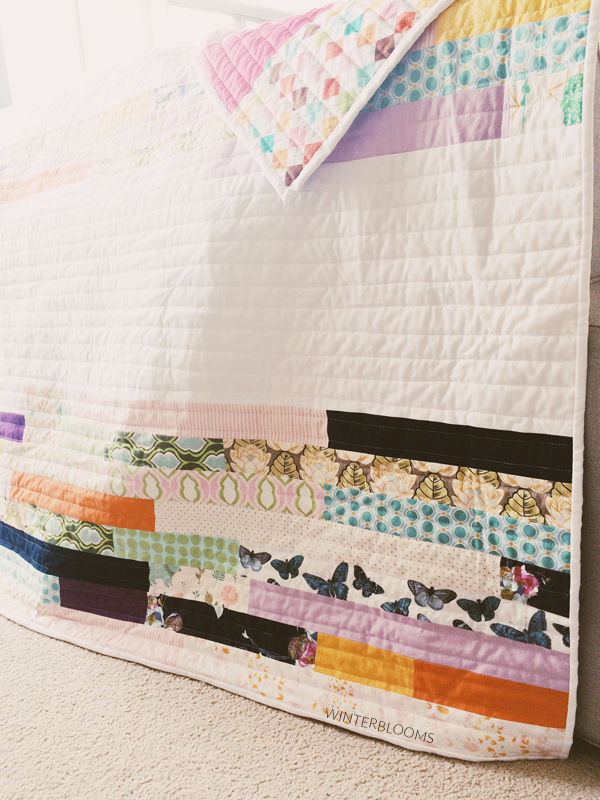 Last time, I was surprised by how heavy the whole thing turned out to be when handling it, which in turn effected my ability to keep the whole quilt straight when quilting. So, this time, I took my time about it (like, I actually quit when I started to get frustrated instead of just pushing through). 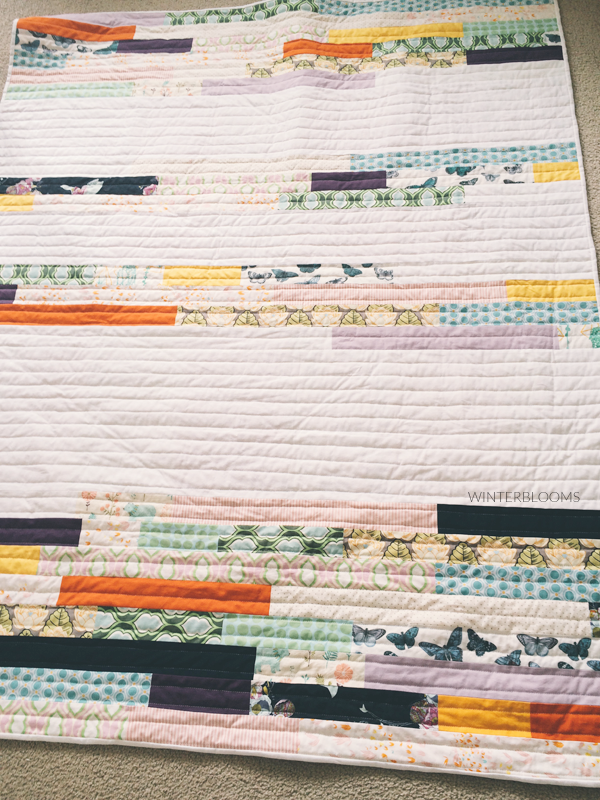 This quilt also helped me make a huge dent in my fabric pile. While I sewed on and off for years with an older machine, I frequently bought fabric just because it looked cute. What can I say -- I'm a bit of an impulse shopper. So, yeah, I had lots of fabric that I really didn't have a plan for at all. I had yards and yards of some fabrics, and little 8x8" scraps of others. So, taking inspiration from this image I found on Pinterest, I cut a lot of fabric into 2.5" strips -- whatever length I could get. Assembling the front was a little slow going, but it helped that I really didn't have a formal plan for the sizing of the whole quilt. I knew it wanted to be an oversized lap quilt, so I just worked on sewing the strips (with the white in between) until the length looked okay. The backing was a little more finicky to handle, if only because I still wanted to go with the whole "get rid of all possible fabric" idea. I really didn't want to go buy a few yards of fabric for a quilt that is essentially a practice run. With a little bit of thought and a lot of very careful measuring (since I was running out of fabric by this point) - I put together this very pink-heavy backing. Overall, this was a really successful project for me. I kept most of my quilting lines straight, got rid of a lot of my overwhelming fabric stash (thus making room for new stuff) and now have a great lap quilt to keep me warm on chilly fall days.